It’s time to look at a pretty different manga. 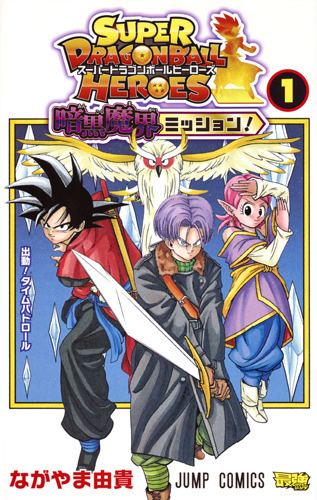 This one is a short spinoff manga about the Super Dragon Ball Heroes adventures. This part of the franchise has always been cool because it pairs together fighters from various Dragon Ball eras including Super, GT, and the movies. It’s pretty cool but naturally with so many characters running around the power levels can get a bit iffy. Typically GT fans will be very pleased here though because Super Saiyan 4 gets a lot of respect. It’s a blast for sure and you’ll wish this series could have kept going. The plot involves a group of Demons who have decided to change the past. They are augmenting past DBZ villains to untold heights with the Dark Dragon Balls and then aim to collect all 7 to resurrect their king. (The king is still alive, but heavily weakened at the moment) The Time Patrol can’t let that stand so the Kai of Time summons Future Trunks to help out. He’s a little outgunned on his own though so she also brings in Xeno Goku who is basically end of GT Goku. The two of them may need more backup though as the villains here may be even stronger than Omega Shenron. Fight hard Z Fighters! The manga never stops to let you catch a breath so you feel like one of the heroes. They have to adapt on the fly because you never know who is going to pop up next. From Super Saiyan 3 Bardock to Super Saiyan Black King Vegeta, there are a bunch of powerful fighters here. Both Vegito and Gogeta make an appearance along with a bunch of other fusions like Gohan and Trunks and classic Gotenks. The pacing is quite excellent and the fights are all a blast. The artwork is great as you’d expect and feels like a classic DBZ story. I won’t go as far as to say it looks as good as DBZ, but it still looks great in its own right. If the manga has any problems it is the fact that there is so much happening that no individual fight lasts very long. As soon as one matchup is just getting good then the manga has to switch to another one. There’s also the power levels issue I mentioned earlier where some characters look a little stronger or weaker than they ought to. The manga does its best to get around that by being as vague with the power ups as possible, but it’s still tricky. Basically when a character gets infected with the dark Dragon Balls they get a huge boost. So huge that a character like Kid Buu can suddenly match up with the current Gogeta. Then you’ve got the demons who are all absurdly powerful. So…these demons in their natural forms are able to keep up with Super Gogeta? I mean, it’s not really a bad thing as the more powerful villains the better, but it is just a little hard to believe. The king of evil also gets a lot of hype as it is hinted that he would be the strongest being in the cosmos. Without even being powered up he was looking pretty impressive. It makes for an excellent climax though as we see all of the Z Fighters engaging in multiple battles as they frantically try to reach him. A shame that we couldn’t see that fight, but maybe in a sequel. That’s right, the manga ends on a big cliffhanger. It looks like the villains from Xenoverse 2 might be showing up. Of course, it’s going to have to wait since the manga then transitioned into the Prison Planet arc and it’s unknown if it will go back to this one afterwards or if you’ll just need to play the arcade game. Either way I hope they keep up these Dragon Ball Heroes stories since there is just so much that can be done with them. I’d also like to see all of these arcs animated since that would just be a blast. 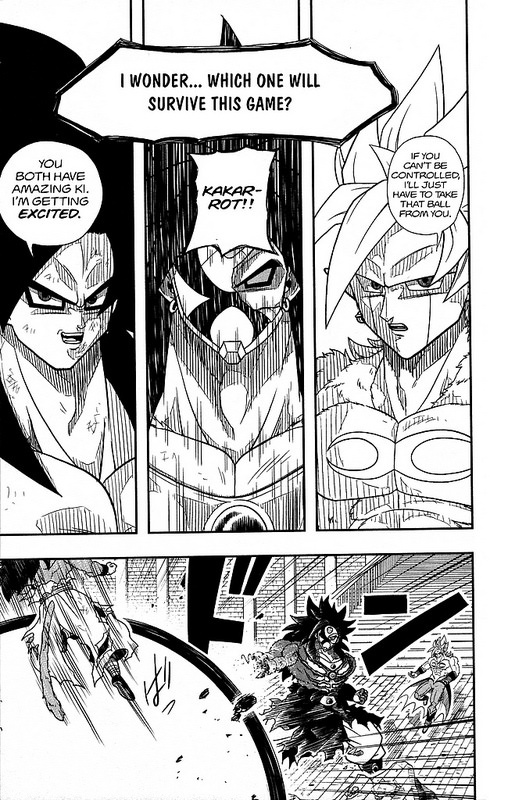 I mean…we even get Super Saiyan 4 Broly to show up! That was hype even if his appearance was rather small. I’m not sure about him only being on par with SSJ4 Goku and that demon guy. In theory Broly should be the strongest one in this place. I do like the manga’s excuse for Goku not going SSJ4 from the start being that it is simply too powerful and that it even corrupts time itself. According to the manga, SSJ4 Goku is even stronger than Vegito which is really something. Makes you wonder what a SSJ4 Vegito would be like. In theory that would be absolutely crazy. That’s also why this manga is so good, it’s absolutely bonkers. I don’t know the demons very well as I never played Xenoverse, but from what I can see here they seem like fun villains. They all have a lot of personality and good designs. The kid with the scythe is cool as I can’t think of any other Dragon Ball character who uses that weapon to fight. It’s a little unorthodox but it definitely still gets the job done. As for the Kai of Time, the fact that she can fight a little is certainly cool. She may not be a powerhouse or anything, but her barrier spells are very handy. Overall, This is an amazing manga. I can’t stress enough how hype it is. It’s very short and basically nonstop fights so there isn’t a lot to say, but it’s something that DBZ fans will really be able to appreciate. It’s only around 2 volumes long so it won’t take very long to read but has high replay value. It would work as a sequel to DB Super if they don’t announce anything in the near future I’ll have a review for the Prison Planet manga out when it finishes, but I suppose that could still be a little while away. Also, I have to admit that it can’t quite match how cool this one is, but it’s still excellent as well. Pokemon is definitely a big franchise that has had a lot of hype moments and hard landings throughout. On the whole it usually has many more successes than failures though and the anime is one that can be recommended to all. The Pokemon Go game is probably the title that I’ve played the most overall as well and there’s just a lot of variety. 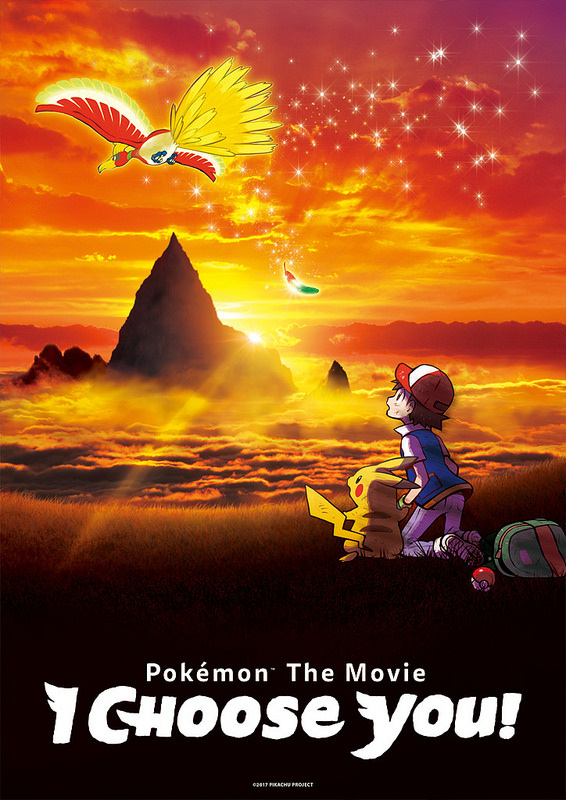 Partially to cash in on Pokemon Go and the nostalgia for the original episodes, this film was made instead of a Alola title. That sounded good to me, but now I wish they had gone the other route instead. Not all of the films have been amazing. They range from great to fairly mediocre. However, this one went to a new direction that I hadn’t even thought to be worried about, it decided to get rather dark. This is not the Pokemon film that we had been waiting for. It’s a reimagining of Ash’s first days as a trainer so it starts with him being late to Professor Oak’s lab. He gets Pikachu and survives a Spearow attack. The first warning bells here is when we suddenly get a massive jump to Erica as Ash wins the gym badge in an instant. The majority of the fight was skipped and what about all of the fights before this one? Sure, they were never going to be able to adapt all of it but why skip that much? Well, Ash meets up with Sorrel and Verity who decide to tag along with him. He comes across an evil Pokemon named Marshadow who wants to corrupt him and plunge the world into darkness. Can Ash stop him and any chance at this adapting more Gym Battles or will he be forced to give up on his quest? I made sure to sit down and read something before writing this review to calm down a bit first, but the film still didn’t sit any better with me. It’s clear from the get go that the writers had a very different idea on why People liked the original season than I did. I liked the original Pokemon season because of the cool gym battles and Pokemon action throughout. Ash was a great main character and Gary was a fun rival. It could get pretty serious, but was a light hearted adventure all around. The movie went through great pains to destroy every one of those concepts. First lets talk about how they ruined Ash. He gets corrupted by Marshadow and starts acting mean to everyone. He bad mouths Charmander behind his back for losing and says that he would have won with Pikachu. He tells Pikachu that he wishes he got a different Pokemon and distances himself from everyone. This leads to a scene of him being in a normal school and finally making it back to the real world where he gets over it. Sure, Marshadow was manipulating him, but why is there even such a scene in the first place? If it had to happen, give it to one of Ash’s forgettable partners. Ash’s character shouldn’t be sacrificed for such a small plot that had no actual bearing on anything. Take away those couple of minutes and not a thing changes. Then it’s also annoying how Ash loses to Cross because he didn’t have any strategy. Telling Charmeleon to use the same attack multiple times when it was clearly not working was also very annoying. Then getting suckered by Cross into losing his feather by the end makes you shake your head. Ash just looked terrible at many points throughout this movie and is certainly nowhere near his TV show counterpart. He has his moments, but at the end of the day he’s not the great trainer that you’ll remember from the old days. As the show is condensing a long season into a movie you at least want the big fights, but we don’t get very many action scenes in the film. Most of the ones that we do get are over in 1-2 hits as Pikachu zaps someone or tackles them away. It was clearly not a priority for the film. The fact that Sorrel never gets to fight at all aside from getting one shotted and likewise for Verity just shows how the fighting was pushed to the side. I wanted actual trainer fights and good battles against the Wild Pokemon. This just never happened and the action in this film is quite limited. It’s something that most of the other films did with a lot more success than this one. Instead, the show focuses on the dark/somber plots from the anime. Butterfree leaving is one of the plots that they choose to keep. Now, it’s not a bad scene in the anime. Ash still got to spend a lot of time with him and we had about 20 happy episodes before and after it. The film is already short so why are we jumping to such a sad scene already? Keep in mind that the film also keeps in the dark Charmander plot where he is abandoned and nearly dies before Ash saves him. The film clearly wanted to be darker and sadder than Pokemon is supposed to be. Those two scenes were already enough, but then the movie really jumped the shark. This is the scene that really wrecked the film beyond repair and what makes it worse is that this scene was absolutely and completely 100% pointless. Sorrel reminds the audience why he is such a terrible character as when he was a kid he snuck out in the cold. He then fainted so the family’s loyal dog Pokemon had to follow him. Instead of picking the kid up and going home, roaring so people could come help, zapping the kid awake, or making a fire, the Pokemon dies. It just dies for no reason and it’s a very sad moment for no reason at all. The film just wanted to get grim dark to establish Sorrel’s character, but what did it really establish? It didn’t change him in any real way. It’s just a passing line and then the film goes back to trying to be happy in the next scene. I can’t stress enough how pointless this scene was and just how terrible it was. With Pokemon Alola also apparently bumping off Pokemon, it’s just a sad state of affairs that the movie would pick this scene to include in the film. There was no way Sorrel could save himself from this scene of course. Moreover, he talks a good game about being friends with his Pokemon, but does nothing to try and stop Cross when he shows up. He does nothing throughout the film. Verity at least has some more personality. I was a little annoyed that her fight with Ash was interupted since we could have had an actual battle Ash should have been able to win that one with the type advantage. Her sob story also doesn’t really have a point as she seemingly had some kind of fight with her Mom but then decides to go home and talk it out. More unnecessary drama, but at least it’s not randomly grim so I’ll take it. The film barely acknowledges it after that one scene so that’s for the best. I’m not the biggest fan of Brock and Misty, but I think I would have taken them over these two. At least I think they would have been more ready to help Ash while these two kids simply watched with astonished looks on their faces the entire movie. Cross is the mean rival and the film does what it can to make the guy as mean as can be. He kicks Charmander and gets away wit it. He beats up Ash and beats up Charmeleon quite a bit and again gets away scot free. While it’s all build up for Ash eventually winning, even that feels negated as he still knocks Ash away and gets the feather. Then he actually turns good which is more of an insult to the cast than anything else. You can’t really convert a character like that in such a short amount of time. While Sorrel reminds Ash that t hey have to respect this guy’s power, they can also respect the fact that they can take him down and bring him over to the cops for Pokemon abuse. Again, I don’t know what the writers were thinking with this film. As for some actual positives, the graphics are good. Everything looks pretty shiny and modern. This way you at least have something to look at the whole time. When the Pokemon fights happen they look pretty good. Take a shot of water every time a fight is interrupted or ends off screen though. It’ll be good for you. The character designs are on point except for an annoying old man who pops up out of nowhere to contribute nothing to the story. That guy just didn’t have a purpose in the film. The soundtrack’s not bad. Most of it’s pretty generic and never comes close to the actual first season. The remix of the opening is pretty good. Not as good as the original of course, but it’s more a case of the singer than the remix. The remix sounded pretty identical to the original to be honest which was good. That’s always been the most iconic Pokemon song for a good reason. The new singer did a fine job as well and it was a good way to kick things off. I would have liked a battle theme to accompany it, but since we didn’t really get many of those, I guess that’s why they didn’t bother. Marshadow is one of the new Pokemon to show up, but I didn’t like him. He was seemingly portrayed as a villain from the start so it was odd that he wasn’t treated like one from the beginning. Unless he wasn’t actually mind controlling Ash and Ash was actually just being super unlikable, but I’m going to just assume it’s the former. He doesn’t even seem that strong and wouldn’t last very long in a real fight. It was cool seeing all of the Legendary Pokemon show up. I was glad Entei basically wiped the floor with everyone although I think Pikachu could give him a good fight 1 on 1. Entei was just running around too much and Ash couldn’t dodge the fire well enough. If he could, Pikachu would eventually take Entei down for the count. Team Rocket is also in this film by the way but seeing as how they just keep getting blasted away over and over again adding nothing to the film, there’s no need to give them their own section. They’re literally just here as cameos for the fans so the writers didn’t really have to think too hard about how to handle them. So, as far as Pokemon films go this is definitely one of the weakest. I was hoping that a call back to the original Pokemon films would result in this being one of the better ones, but I suppose that just made the flaws more evident. I don’t often like Elseworld stories so I suppose that overrode the nostalgia. The whole thing just didn’t feel right and honestly it just should have had a completely different cast if the plot was going to be so different otherwise. Rename the main character as Stephen or something and then it’s less annoying. I don’t think the score would be any better since it still has the Pokemon death which is effectively an animal death, but it would certainly be less personal. At any rate, I hope this one doesn’t get a sequel and we just go back to the main Pokemon movies. For an actual list, from what I remember of each film here is how it all ends up. 1. Genesect, 2. Pokemon Destiny Deoxys, 3. Mewtwo, 4. Entei, 5. 2000, 6. Giratina, 7. Heroes, 8. Darkrai, 9. Kyurem, 10. Black n White, 11. Lucario, 12. Hoopa, 13. Arceus, 14. 4 Ever, 15. Volcanion, 16. Zoroark, 17. Jirachi, 18. Diancie, 19. Ranger, 20. I Choose You. The list is a little rough towards the middle. My recollections of 4Ever, Lucario, Darkrai, Jirachi, and Ranger are spotty at best. The Top 5 are pretty well set by this point and will be rather tough to surpass, but not impossible. It’s probably fitting that Sun and Moon, the weakest season in all of Pokemon contains the weakest Pokemon film. If you count it as an Alola film at all, but it’s in that era at any rate. I can also see why People didn’t like the climax to this film. It just feels all over the place and not really focused. Mind controlling all of the Pokemon and starting a big fight could be good..if the fight actually happened and we weren’t in the final minutes of the film. Ripping off Ash’s famous statue scene from the first movie is also rather shameless and it’s not even handled all that well. After all, this character hasn’t even been through much at all so it’s not as big a moment as it could have been. You can’t do a scene like that so early. The first movie’s scene was also epic as well as sad while this one is just adding yet another sad scene into the mix. To save this film, it should have just been an adaption of season 1. Why even give Gary a cameo if he isn’t going to do anything? I was expecting him to show up, but it simply never happened. Why give us the Erika fight and mention the Pokemon League if it’s never going to happen either? I suppose these teases are supposed to be fun as you decide to watch the show again, but it just makes you wish for those moments instead of what you’re actually watching. Following the show and having a bunch of Gym Battles would have been a blast. I’d love to see a Pokemon Kai of sorts that does the first season all over again with new animation and I wouldn’t mind if they cut out the filler episodes so it focuses on the main plot. It could have been a blast. Then we would also get a bunch of cool action scenes as well. Well, aside from the animation and soundtrack, a positive for the film would be that Pikachu looks good. While he did leave Ash pretty quickly once Ash entered into dark mode, he looked good in all of his fights. You never enter a fight thinking Pikachu will lose since he looks so impressive here. His speed is on point and he definitely is one of my favorite Pokemon at this point. Top 5 for sure and since there are over 700 Pokemon that is definitely an impressive feat. It would have been nice to have seen more of Ash’s Pokemon, but Pikachu is always the really important one anyway. I like to think he really gave Ho-Oh a great fight as well. Overall, This Pokemon film just didn’t feel like Pokemon. That’s the biggest problem with it. It’s very sad and dramatic throughout. What the writers didn’t understand was that it’s okay, or at least not terrible to have sad and grim scenes in a show because you can have dozens of happy episodes between them. You can have a grim plot if handled right as well. However, in a movie, you have a limited amount of time so adding in even just a few sad scenes can change the tone of the entire movie. By having a very cruel rival, death, and permanent farewells in one movie, there’s no chance for a happy moment. The happy scenes in the film instead feel rather hollow, especially as Ash is sharing them with complete strangers who aren’t even that likable. Verity isn’t a bad character, but not a particularly great one either and Sorrel is just bad. you want a Pokemon film to be a fun one, especially if it’s an anniversary film. Instead, you’ll walk away from this film being pretty upset and I’m sure the feeling would have been even worse if you had seen it in the theater. Take my advice and skip this film, it’s just not worth it. I’ll still look forward to the next film though as I’m sure it’ll catch itself and start climbing up again. It’s time to look at another Elseworlds Superman story. I believe Elseworlds refers to any alternate Superman story, but if that’s not true then you know what I mean. This one’s more of a character story so it deals with the Clark Kent aspect of Superman more than the classic hero form. It’s a fun enough story although this is definitely one of the less likable versions of Superman. Time to see how the hero would operate in a more realistic Earth where he is one of the only heroes…or as far as he knows. There is lightly hinted to be a bunch of other superheroes operating, but we don’t get to see them. Clark Kent has been teased a lot because his parents named him that after the classic comic book character. Clark’s never liked the fact that people keep calling him Superman and then he also gets bullied at school. Luckily, this all changes when he discovers that he actually does have Superman’s powers. It is to a lesser degree as he can still be injured and being near the Sun doesn’t recharge his abilities. Still, it’s more than enough for him to be a hero, but what he really wants is to just lead a normal life with Lois while stopping some crimes as well. Can he achieve this perfect balance when the government is constantly at his heels? The concept of having Superman in a normal world is always interesting. He would certainly be even more of a threat in the eyes of the government since there really wouldn’t be much that they could do to him at that point. Malloy is the main figure head for the government and he is actually pretty likable. He does his job quite well and really hounds Superman. 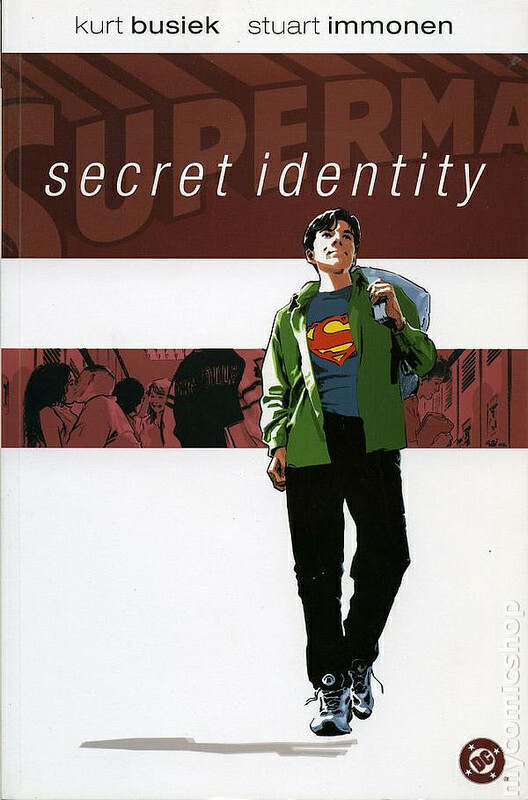 Even after the two of them reach a mutual understanding where Superman will help him out in any tricky situations in exchange for the government stopping all efforts to find out Superman’s true identity, Malloy continues to mildly try from time to time. Eventually, both of them grow quite old and we even see Malloy retire. The mutual respect between the two was handled well and government agents don’t always have to be completely unreasonable stereotypes. Malloy was certainly much more realistic. Of course, it did help that Superman proved how easily it would be for him to take them all down if he was evil. I did mention that I didn’t care all that much for Superman here. Well, that’s because the comic went a little too far to make him realistic. After all, this version is aware of his comic counterparts and as such, his personality is quite different. He tends to get angry with everyone a lot easier when they compare him to Superman and loses his cool at his colleagues as well when they make a few small jokes about it. Obviously, they shouldn’t overdo it since Superman doesn’t like that, but he didn’t really handle the situation well. He also started properly using his X-Ray vision after realizing that it would probably be harmful to other people, but I would have hoped that his morals would stop him from even attempting that in the first place. Likewise, the story of his Mom walking in on him in a dicey situation was also rather unnecessary. Beyond that, Superman was all right for the most part in his portrayal as just an average guy, but Superman should never be an ordinary person. He should always be a beacon of hope, a guy with absolute morals. This is not meant to be the real Superman of course, but that’s why he isn’t as likable as he could be. Lois is also not as good as her comic counterpart of course, but she’s all right. She helps Superman through a lot of his decisions and overlooks the fact that he cracks a lot. She’s dependable and helps him solve all of his problems. Without Lois at his side, things probably would have been pretty dicey for him. 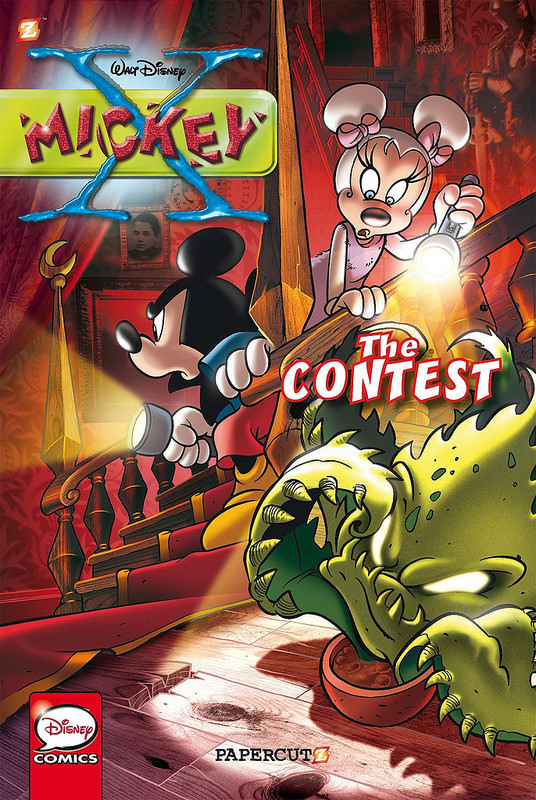 Their two kids also get a small role towards the very end of the comic. There wasn’t much of a point to adding them, but since the comic showed Superman’s development from kid to old man, I suppose it was a good way of showing how much time has passed. Since they have powers of their own, he won’t have to worry about them too much. The comic’s biggest flaw was probably the art. I definitely didn’t like it as it went for a gritty, indie-esque style. There were no flashy colors or awesome double spreads and instead it was just all darkly colored. The style didn’t work so well for the comic. There weren’t any real fight scenes so the art didn’t have to worry about that, but better art could definitely go a long way. The New 52 look may have shifted the tone a little, but it’d be worth it for the incredible character designs. Still, the plot is more important in this case and the story was interesting. I ended up reading the full trade paperback in one batch since it was a lot of fun to read through. I won’t call it a great comic, but it was a pretty good one and makes for a good read. It’s always nice to read about the various portrayals of Superman and aside from the evil versions which I’m tired of, most of them tend to be quite good. Even if the character himself was lacking, the world around him was interesting. The government stole the show here although it was a shame that aside from Malloy, they were all a little shady and without morals. Even the TV reporter who pretended to be a nice person turned out to be just another villain by the end. It’s easy to see why Superman doesn’t trust anyone with his secret identity aside from Lois. Meanwhile, he got to end his school days on a high note as he saved one of his classmates which earned him respect from the rest of the class. Even the bully complimented Clark and stopped messing with him after that. It’s always nice to see the bully finally stop once his victim has actually helped him out. Of course, it’s just as satisfying to see the bully get knocked out since it will encourage him not to be a bully at all, but we can always say that this bully stopped permanently after the experience. While there were no fights, we did get a few action scenes. The big fire next to the school is one example of this and Superman also fell into a government trap a few times which resulted in some energy blasts and buildings breaking. Superman never goes down without a fight after all and you have to give the government some credit for having such large armaments at the ready. If nothing else, America is certainly prepared for any situation. Overall, Superman Secret Identity is definitely a good comic to check out if you’ve ever wondered what it would be like to wake up with Superman’s powers someday. It would mean that you would have a super life with two kids, a wife, and constant thrills by flying around all day. You could eat whatever you wanted whenever you wanted too since you could zoom over to Italy and buy a Deep Dish pizza before zooming to France and grabbing a Pepsi…because why not? The government would be after you, but as long as you weren’t too obvious you would probably be okay. I’m sure we’ve all thought about having Superman’s powers and I don’t even know what I’d do with them first. The possibilities are endless, but one thing’s for sure, I’d be going around the world trying out every limited edition snack that I could find. My super metabolism would prevent me from ever gaining any weight while still enjoying all of the flavors. That’s why the concept behind the story is so good and why it doesn’t work as well for Batman comics like Year One. I’ve never been tempted to wake up as a normal guy in a Bat costume. The gadgets are handy I guess, but not really for everyday life. I wouldn’t mind suddenly being a hand to hand master though.